Summer is a time for relaxation, fun, and spending time with family and good friends. We celebrate with fireworks on the Fourth of July, have cookouts, and sit around campfires. As enjoyable as these simple pleasures are, they can also be accidents waiting to happen if we don’t understand the personal safety dangers associated with each. Taking time to learn a bit more about fire safety can keep your summer fun all season long. You may see fireworks for sale at local stores or hear some going off in your neighborhood. Knowing about the regulations for fireworks in Indiana can be valuable. 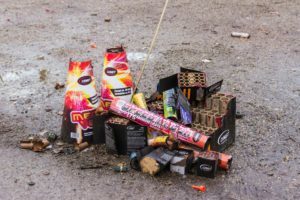 While fireworks are currently sold around the state, Indiana permits local communities to regulate the dates and times that fireworks can be set off — from 5 p.m. to two hours after sunset on June 29 and 30 and July 1-3 and 5-9. On July 4 fireworks are permitted from 10 a.m. to midnight. Many people may not know the state regulates when fireworks are allowed, so it’s important to check what your local community permits. Are some fireworks considered safer than others? No fireworks are safe; injuries can and do happen unexpectedly every year. The Lafayette Fire Department encourages the public to attend a public firework display at their local July 4th festival in place of setting off their own consumer fireworks. Public fireworks displays are required to follow stringent guidelines, and the risk of injury to the public is greatly reduced. Some people think sparklers are safe for children, but emergency rooms see many children every year due to injuries involving sparklers. A sparkler burns at 1200°F. To give you an idea of how hot that is, glass melts at 900°F. If people are still interested in having fireworks at their own homes, what information should they know to keep themselves, their children and guests safe? Those using consumer fireworks need to take these precautions to ensure everyone’s safety. Ensure the ground fireworks are set off from is level and secure. Do not allow young children to play with or ignite fireworks, including sparklers. Never place any body part directly over a fireworks device when lighting the fuse. Back up to a safe distance immediately after lighting a firework. Never try to relight or pick up fireworks that have not ignited fully. After fireworks complete their burning, douse them with plenty of water, and place them in a container that will not burn. Consumer fireworks should be set off from an area that you have permission to use. Setting off fireworks from public streets is not permitted. Fireworks that go into the air may not land on someone else’s property without their permission. If damage to another property occurs, you could be held responsible. Too often firefighters are called hours after an at-home fireworks display to extinguish a house fire caused by a firework not doused and placed in the trash. What should someone do if an at-home firework injury occurs? Roll over and over or back and forth until the fire is out. Anyone burned by fireworks should seek medical attention. Let’s change gears a bit and talk about another fun summer pastime – grilling! Many of us love to cook outside in the summer. It keeps the house cool, there’s little cleanup and food tastes amazing cooked outside. 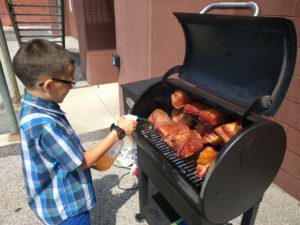 What are some things to consider when using an outdoor grill? Precautions for outdoor grilling are not unlike those we should be taking while cooking in the kitchen. Keep children and pets clear of the grill by at least 3 feet. Ensure the grill is placed well away from the home, deck railings, and out from under eaves and overhanging trees. Keep the grill clean by removing any grease or fat to reduce the risk of a fire getting out of control. Are safety concerns different for gas versus charcoal grills? We should be aware of some safety concerns for both gas and charcoal grills. Gas grills use a flammable gas such as liquid propane or natural gas. You can check for any gas leaks with a soap and water solution and a spray bottle. Spray the soapy water on the connections; if a gas leak is there, you will see bubbles form. Take action to fix the leak or have the grill serviced. When lighting a gas grill, always ensure the lid is open. If the flame goes out, turn off all valves and wait at least five minutes before reigniting it. Any time we work with flammable gas, there is risk. We want people to enjoy cooking outside, but we also want them to do it as safely as possible. Charcoal grills pose a different risk. The charcoal being burned produces carbon monoxide, a colorless, odorless and tasteless gas that can be deadly. Use a charcoal grill in a well-ventilated area. If lighter fluid is used, only use charcoal lighter fluid. Never add charcoal fluid or any other flammable liquid to a fire that’s already burning. A good alternative to charcoal lighter fluid is a charcoal chimney starter with newspaper as fuel to get the charcoal ready. When finished grilling, let the coals completely cool before disposing of them in a metal container. The fire department responds to many fires that result from putting hot charcoal in trash bins. 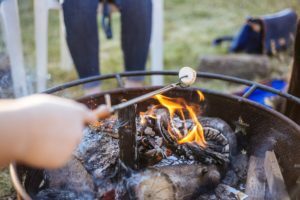 Another favorite summer pastime is sitting around a campfire and roasting marshmallows or hot dogs or just listening to the crackling of the fire. What safety precautions should we take to prevent unexpected injuries? Keep an adequate water supply nearby, like a water hose, in case the campfire gets out of control. Make sure the fire is a minimum of 25 feet away from any structure or anything that can burn. Clear away dry leaves, sticks, low-hanging tree limbs or shrubs to help ensure the fire stays confined to its designated area. Avoid burning on windy, dry days or in any area under a weather advisory. Watch children while the fire is burning; children are curious and tend to be drawn to fire. To ensure children and pets stay clear, attend to the fire at all times. Never use gasoline or other flammable or combustible liquids on campfires. All you need to start one is small, dry kindling. If you’re using hot dog or marshmallow sticks, use care to see that no one touches or is poked by the pointed end of the stick. Where are campfires or other open burns allowed? Individuals should check with their local fire department to see if these activities are permitted. Many cities and towns do not allow them. If they are permitted, burn only clean, natural wood. Burning tires or items with foam or plastic is never allowed. These types of fires should take place in a noncombustible container that can get plenty of air to aid in the complete burning process and reduce smoke. Even if these types of fires are permitted but the smoke is a nuisance to your neighbors, you may be asked to extinguish it. A good rule of thumb for a campfire at home: Be a good neighbor by checking with your local fire department before burning anything on your property. How can you practice good fire safety habits this summer? Leave fireworks to the professionals. Follow safety guidelines for your grill every time you use it. Keep children and pets away from grills and campfires. If you are in an Indiana 4-H club or are a 4-H club leader in Indiana, consider incorporating fire safety training into your next club meeting, or invite a local firefighter to attend a club meeting for more fire safety training. If you are interested in additional fire safety resources, contact Angie Frost at alfrost@purdue.edu for more information. Visit our Indiana 4-H Facebook page (@Indiana4H), and tell us how you plan to use fire safety rules to protect yourself and your family this summer. “Pledge your health to better living” by observing all fire safety rules this summer and throughout the year! Brian Alkire is the assistant chief of fire prevention with Lafayette Fire Department in Lafayette, IN. Brian has been a firefighter for 25 years. His duties include overseeing code enforcement in commercial and multi-family structures, fire investigations of unknown origin and public education to both children and adults. Brian attended Purdue University, studying sociology and physiology prior to being a firefighter.